If your job entails protecting data, providing faster access to data, or simply understanding data, you are probably grappling with an extraordinary storage expansion that’s most likely driven by massive copy data proliferation. You are not alone. 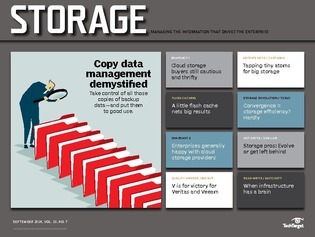 The featured article of this month’s exclusive e-zine presents an in-depth look at methods to control and manage the multitude of copies of backup data companies typically produce. Inside, you’ll take a look at standalone vs. in-place copy data management (CDM), core CDM features, and CDM benefits.